We are looking forward to seeing everyone at Sim 'n Fun 2004. This year the event will begin on Tuesday, the 13th of April through Monday, the 19th. We have a forum tent reserved for two hours starting at 11:00 a.m. on Friday, the 16th. Check your daily schedule for the tent number or any last minute changes. Come, join us, for the 7th Annual QBA Hot Dog Roast at our campsite on Saturday, April 17th at 6:00 p.m. Pick up a map at the forum on Friday. We will have plenty of dogs, pop and other good things to eat at the best price on the grounds; only S2.00 per person. Be sure to bring photos of your bird and your own folding chair, if you can, because you will certainly want to sit down and chat about your favorite subject. If you have something you would like to present to the group, bring it along and we will gather the troops. It will be a fun, casual evening with friends. 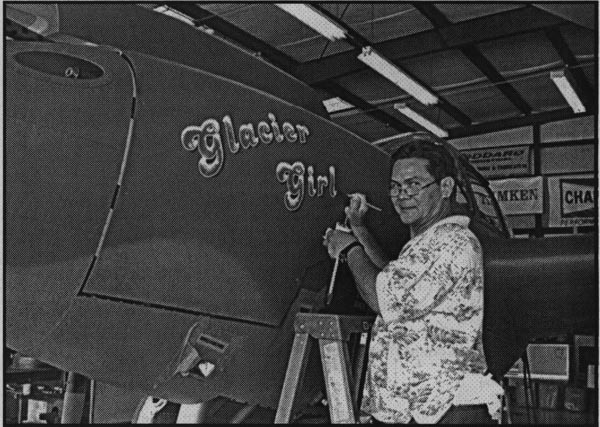 QBA member, Carl Abejon of Burbank, California, is pictured here putting his artistic touch on the very famous P-38 dubbed "Glacier Girl". You can order a printed copy of Q-talk #103 by using the Q-talk Back Issue Order Page.